CEO and alpha werewolf Drake Wilder has given up the search for his one true love. When he discovers that she’s a secretary in his company, Drake’s primal instincts kick into overdrive. What he wouldn’t give to have her fingers rake over his body instead of the keyboard… Free-spirited bartender Emelia Hudson wants nothing more than to make her Seattle-based bar succeed. But when profits decline, she slips into a dress suit and secures a nine-to-five. After learning that her bar has become property of Wilder Financial, Emelia is determined to get some answers. Two can play the ruthless business game. If only her attraction to the boss wasn’t so intense… When Drake’s twin brother senses that Drake has found his match—and now inherits their father’s billion dollar estate—he hatches a plan to take Emelia out. Drake vows to protect her at all costs, but he might have to pay with his own life. 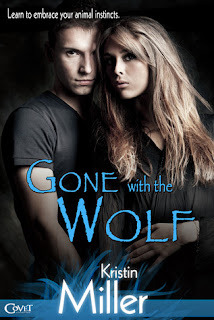 This book had such a great premise, and I love shape shifter romances. I'm a sucker for them-especially when the heroine is hell bent on revenge. However, I had a lot of trouble feeling the romance between Drake and Emelia. I just didn't understand how she go from hating him to loving him so fast with no real reason for the switch expect for a hot drunken make out session. Drake and Emelia have all of the qualities I normally love in a paranormal romance couple: both are independent, headstrong and unforgiving to each other, but I never really connected to the romance being told. I think a huge part of the reason why I didn't connect to was that it was predictable and read more like a contemporary romance then a paranormal one. I think my hopes were just a little to high for this one. This is a great romance for someone who hasn't read a lot 0f pnr, but for me sadly, it just didn't take and I really wanted it to.